Tetsuya’s comes with a formidable reputation: for the past four years voted fourth or fifth-best restaurant in the entire world by readers of Restaurant magazine. Chef/proprietor Tetsuya Wakuda grew up in the Japanese town of Hamamatsu, before his family relocated to Sydney in 1982. Since opening the original Tetsuya’s in 1989, he has moved to his current simple, relaxing restaurant that sits behind manned gates that shield it from the hustle and bustle of Kent Street, with the dining room focused on the calming interior garden, filled with scarlet-coloured maple trees, streams and waterfalls. Everyone has the tasting menu of around 10 courses, and you may opt for a matching wine service, or choose from the outstanding wine list. We did a little of each, drinking some fine Riesling by the bottle, but also having glasses of sparkling, red and dessert wines, chosen extremely well by the sommelier. The food is Japanese in influence and execution, so interpretations of sushi and tempura do appear, but Tetsuya leans heavily on modern French cuisine, sources fine local produce, and is constantly inventing new techniques and combinations in his experimental kitchen above the restaurant. Not every dish here absolutely wowed me, but overall it was outstandingly good in terms of service, food and wine. Highlights for me included the signature confit of Tasmanian ocean trout with konbu, daikon and fennel, that was an extraordinary piece of fish, barely cooked, with the punch and vivid flavours of the daikon (a sort of raddish) and konbu (a seaweed, rich in the meaty, earthy flavours of Umami). I probably preferred the ravioli of Queensland spanner crab, a single, soft parcel of pasta encasing dense white meat, served with a tangy tomato and basil vinaigrette. Of the more substantial courses (though the confit trout was a very healthy portion), grilled Wagyu beef with lime and wasabi was delicious, though I did find the paper-thin slices of beef slightly less interesting in terms of texture than they might have been. Twice-cooked spatchcock had been de-boned, and was meltingly moresih served simply with Soya beans.After a gorgeous and unusual dish of Comte cheese, shredded over warm, jus-enriched puy lentils, beetroot and blood oange sorbet was the first of three brilliant desserts, each simple and light enough to be manageable, but delicious enough to satisfy even the sweetest of tooth. If you can manage to secure a table at Tetsuya’s, do so. Open for dinner Tuesday to Saturday, lunch Saturday only. The tasting dinner is $195, with matching wines at $95. The best thing about Doyle’s is probably the ferry trip to it, sailing out of Circular Quay between the Bridge and the Opera House, and the view once you get there. In truth the seafood at this large, bustling restaurant institution was far from perfect, with prawns and scallops cooked to a rubbery blandness, and the fish and chips in a good, light batter, but the fish slightly overcooked and again rather lacking in flavour. A slice of Sydney history that in the ultimate foodie analysis fails to rise above tourist-focused mediocrity, but you will enjoy the overall experience of a trip there. Moderately priced. Open daily for lunch and dinner. Another Sydney institution in the heart of Chinatown, the Golden century is a vast seafood-focused Chinese restaurant over two floors, that was jam-packed with both Asian family customers and tourists on my visit. The food may be a slightly Australianised version of authentic, but it was of excellent quality on my visit, served with bustling good humour amongst the cacophonous surroundings, by the efficient staff. On the ground floor, marvel at the wall of fish tanks housing the freshest of ingredients possible in a slice of downtown Kowloon, but make the trip upstairs to at least gaze longingly at a ferociously upmarket wine list, with big vertical collections of Petrus, Leroy, Lafite, Grange and all the world’s great wines. Obviously there are some high-rolling regulars here. Highlights for me where the Oriental version of salt and pepper squid, the scallops sauteed with snow peas and masses of pungent garlic and chilli, king mushrooms with vegetables and the deep fried squab pigeon. Peking duck and omelette rice were both exemplary of their type. Moderate prices. The wharf is a smart development, with upmarket housing (Russell Crowe has a flat here) and plenty of trendy bars and restaurants. Along with four of my fellow judges from the Sydney Wine Show, I adjourned here for lunch after tasting on our final day. This was a fabulous find, and a wonderful place to take a table on the wharfside and enjoy a culinary journey through southeast Asia cooked with marvellous flair. We started with some Chilli Salt Squid, the chunks of soft meat in a hot and spicy coating. Corn and Zucchini Cakes were Bhaji-like dumplings, served with a fresh coriander and chilli sambal, but the best of our starters was arguably Steamed pork & prawn wontons with Chinese black vinegar, which were extraordinarily soft and melting, and densely-packed with meat. Every dish here was fresh, well-cooked and beautifully put together, other highlights being a Penang Curry of braised Wagu beef shin which was gorgeous – a deep, rich, sweet yet hot curry sauce containing meltingly soft chunks of beef – and free range Thirlmere duck pancakes. We had one or two swift Tsingtao beers before turning to the excellent wine list, where Poliziano’s Vino Nobile di Montepulciano was perfect with the beef at $95.00. All in all, this get’s a top recommendation. Moderate prices. The four restaurants reviewed in the city are all in the Southbank area. I was based in Southbank, and feeling fairly exhausted towards the end of a month-long trip, we chose from the copious number of restaurants on our doorstep rather than take taxis or have to read streetmaps each evening! Pettavel winery in Geelong, southwest of Melbourne, is a determinedly fine dining destination. Dinner is served only on a Friday evening, but at lunchtimes a five-course ‘banquet’ is on offer in the stylish, cool, contemporary restaurant with panoramic views over the vineyards. The menu changes regularly, but on my visit started with a wonderful dish, or trio of dishes: simply called ‘tomato’ on the menu, it turned out to be pungent, sharp tartare of tomato flesh with capers, onion, coriander and lemon, a little schooner of ‘essence’ of tomato, with a confit basil leaf, and a gazpacho sorbet, served with fresh anchovy. Each was fresh, vibrant and decidedly tomatoey. Next came a linguini of Morton bay bugs which was superb: the home made linguini and fat, fleshy seafood doused with a warm olive oil dressing and crusted with a crunchy melange of breadcrumbs and preserved lemon. Third up was quail, with a breast and leg that had been dressed in a spicy, crunchy coating and deep fried, served with a plum, hazelnut and watercress dressing. Though disconcertingly reminiscent of Colonel Saunders, the quail was moist and tender and the sauce delicate yet full flavoured. With each of these, and the course that followed, I chose a half glass of one of Pettavel’s wines (at around $4 a time), and whilst few of these really rocked my boat, it was a nice way to mix and match and I chose their Pinot Noir with my main course of saddle of local rabbit with a pithiver of leg. The saddle was moist, rich and dense, and the pithiver – an impossibly elegant little puff pastry dome – was filled with dark confit leg meat. This dish was served with braised red cabbage, and was entirely successful. For dessert, a raspberry and chocolate trifle was playful and very good, a tall glass filled with alternating layers of a dark, moist, booze-laden chocolate cake, custard and a jelly infused with plenty of fresh raspberries. At $70, this is a bit of a bargain way to enjoy serious food for a few hours of a lazy afternoon. Moderate. The highlights of a visit to this northern Queensland town are the Great Barrier Reef just offshore, and the Daintree rainforest to the north. Unfortunately my February visit coincided with torrential tropical storms that put both out of bounds: more emphasis was then placed on the town and its restaurant scene, and it didn’t take long to realise that Cairns, so beloved of backpackers and outdoorsy types, is far from a gourmet heaven. This is a buzzing little cheese shop, deli and coffee shop, usually filled with winemakers and happy locals, tucking into not only delicious cheese platters, but wonderful, overstuffed grilled sandwiches, a small selection of daily special lunch plates and some yummy looking cakes and pastries with first class coffee. The range of locally sourced deli goods ranges from smoked meats to honeys and preserves, and they’ll even make up a wine and cheese matching basket for you – you take your basket of cheeses to the participating wineries, who will pour you samples of specially chosen wines to match. The crowded, small cafÃ© is supplemented by a pavement terrace, where you can enjoy the to and fro of McLaren Vale life. Inexpensive. Market 190 is a brilliant spot for breakfast on a sunny South Australian morning. Sit at one of the tables around the front terrace and lawn, and order the ‘Vintage Breakfast’, a copious plate of Venison sausages from nearby Kangaroo Island, scrambled local eggs, thick smoked bacon and juicy grilled mushrooms. Coffee is great too, and lunches run from gourmet sandwiches to dishes made using local produce, some of which can also be purchased from the deli inside the store: look out for ‘Spice Girls’ range of condiments and sauces from a local company. I think Market 190 would become a regular hang-out of mine if I lived in the area. Inexpensive. This place is a real institution in the wine country, where Russell has been turning out his wood-fired oven pizzas for over 15 years, to very happy customers. Russell’s is a pretty tumbledown place, with bags of atmosphere and a big open fire burning in the courtyard. There are indoor and outdoor pizza ovens, built by Russell (who has even published a book on how to build your own pizza oven) and the deal is that you pay $30 (about £15) and a procession of pizza’s will be carried through the restaurant, letting you take as many or as few slices as you wish. Do not miss the seafood pizza, and definitely do not miss the spiced Moroccan pizza, with ground lamb, coriander, mint and yoghurt. Desserts (included in the price) are said to be excellent, but having had one slice of pizza too many, I passed. Inexpensive. Newly opened in the winter of 2006, Fino is a Meditterranean style restaurant in the town of Willunga that has all the local foodies buzzing. It is a contemporary and casually chic dining room, where really good local ingredients are shaped into quite traditional dishes, yet with a thoroughly modern flair. A coarse, meaty rabbit terrine was delicious served with a caper-laced salad and crusty bread. A dish of thickly cut skate, peppered and grilled in plenty of olive oil was just terrific, the fish flaking at the touch of a fork. Coffee was excellent too, completing a moderately priced lunch served with charm. The Victory is an historic Victorian era pub and hotel owned by an ex-winery owner and wine nut, with an impressive cellar. Food can be eaten indoors or out on the terrace, which is the recommendation as The Victory occupies an incredible hilltop position with views over the ocean. Food is wholesome, well-sourced and well cooked. I really enjoyed a starter of salt and pepper squid, served with a chilli dipping sauce. The squid was beautifully soft and delicate, and matched a lemony Australian Riesling very nicely. For mains I chose braised Venison shanks, served on a mound of creamy mash, with a rich red wine gravy. The Victory is a bustling place. It’s not fancy, and has a pubby atmosphere, including the owner’s two golden retrievers in attendance, but it is a pretty special spot and the food is good. Moderate. Built onto the Chapel Hill winery, the Gourmet Retreat is the most upmarket place to stay and eat in the Vale. It is a beautiful space, with elegant, subtle decor incorporating lots of natural wood and stone. This is the full gourmet experience, with fine tableware and linens, and extremely good food on my visit. A little appetiser of carpaccio of King George whiting was delicious, flaked with smoked almonds. The first course was a knock-out: a fricassee of Marron (large langoustine tails) on a lightly creamy pasta and asparagus. Then, poached pigeon breast with a mushroom confit, that was again top-notch with beautifully gamy pigeon. My main course was a rich and strongly flavoured dish of beef, bone marrow and broad beans, the beef having been wrapped in pork for cooking, so that the richness and flavour of the pork infused into the meat and sauce. Dessert of citrus sorbet was delightfully fresh and light, and Lavazza coffee was served with absolutely scrumptious chocolate truffles. This is very seriously good food, and highly recommended. Expensive. This is one of the upmarket but casual cafe/restaurants in downtown Canberra where you will be rubbing shoulders with politicians, lobbyists and media from the nearby Parliament. Seafood, small plates and more substantial dishes feature on an eclectic, Italian influenced menu and daily-changing blackboard selection, accompanied by a fine wine list including older vintages. I drank Henschke 1993 Riesling with a plate of assorted dips and flatbread, followed by a delicious plate of tiger prawns, simply char-grilled and served with a lemony butter sauce. Modern, serious cuisine and a buzzing atmosphere make this a fun spot, indoors or on the sunny pavement terrace. I must admit I loved this downtown Chinese restaurant where I enjoyed one of the best meals of my trip, despite eating in more upmarket places. Chairman & Yip is no mom and pop little place by any means: it is fairly large, with a terrific wine list and exceptional staff that seem to really know and understand the food on offer. Seafood is the big thing here, with daily specials chalked on the blackboard and menus concealed within a pile of Oriental Arts magazines on your table to fool the first-time visitor. We shared some exceptionally good and flavoursome duck pancakes and a plate of king prawns in a cream and spinach sauce to start, moving on to share a superb red chicken curry, blue-eye cod poached and served with a lightly creamy sauce, and a blackened salmon dish, roasted with cinnamon and blackening spices. Washed down with a bottle of Pewsey Vale 1997 Riesling (which was superb, buttery and rich but still cut through the sauces beautifully), this was a moderately priced and excellent meal. The Park Hyatt is a large hotel created from an original 1920’s modernist building. It is a luxurious and extremely comfortable five-star hotel, where I was delighted to find the buffet-service restaurant (my pet hate and normally a huge, flashing red danger sign for food quality) was very good indeed, with icy-fresh oysters and tiger prawns the highlight of the cold table, and some very good hot food that was consistently fresh and tasty on the two or three occasions I ate there on a four night stay. The restaurant at Shaw winery in the Murumbatman district in the north of the Canberra vineyard area is new, opened only in spring 2005 and is still one of the few vineyard restaurants. Owner Graeme Shaw has chosen an Italian theme, not only with some excellent foods, but a delicatessen selection of olive oils, vinegars and pastas, and a wood-fired oven making some of the best pizzas in the region. There is a broad terrace overlooking the vineyards, and a spacious restaurant indoors. The chef here is taking the establishment of this restaurant very seriously, with his herb and vegetable garden shaping up to the side of the building, and there are hens and cross-bred sheep amongst the ingredients in waiting on the estate farm. The food is very good indeed, including some lovely antipasti style starters of cheeses, salads, seafood and dips, and a terrific artichoke and Parma ham pizza to follow. Any of Shaw vineyards quality wines can be purchased at retail prices plus three dollars (just over one pound sterling), including their excellent Riesling and Cabernet Sauvignon. Terrific espresso to finish makes this an excellent venue for a day in the vineyards, being less than an hour from central Canberra. One of the top winery restaurants, Salter’s Kitchen is an airy, modern restaurant, tasting bar and delicatessen as part of the historic Saltram estate. It mixes quite cutting edge, fusion cuisine with suitablity generous wine country portions and a very relaxed ambiance where the young, polo-shirted staff are as enthusiastic about the wines as they are the locally-sourced ingredients in many of the dishes. Excellent potato, sea salt and rosemary flatbread was served with olive oil and Dukkah, a North African dry paste of nuts and seeds that is absolutely addictive (it’s home made and can be bought in the deli). My main course of a beautifully cooked piece of cod came with a liberal topping of Moreton bay bugs – sautéed prawn – and a zingingly fresh salad. Washed down with a glass of wine from a great selection at the tasting bar, this is a top lunch spot, though it is also open for dinner on Friday and Saturday evenings. A visit to the Seppelt winery is an absolute treat, as you drive down its famous avenue of palm trees and turn into the absolutely beautiful old winery, parts of which date from 1851, and anticipate a tasting of their extraordinary old ports, sherries and tokajis, including the famous 100-year-old Tawny. Seppelt’s grounds are gorgeous, with mature gardens and winding paths to follow. One of the nicest treats is to book yourself a tour, followed by a picnic – the visitor centre will make you up a basket with some sparkling wine, and a selection of cheeses, charcutrie and sweet things to enjoy on the lawns. Lamonts Cottesloe, 12 Station Street, Cottesloe, tel. +61 8 9385 0666. Kate Lamont is one of Western Australia’s best known chefs. She also happens to be the granddaughter of Jack Mann, the legendary winemaker. In fact, she started out making wine at her family’s winery, Lamonts in the Swan Valley before donning a chef’s hat and opening Western Australia’s first winery restaurant. That was 20 years ago when, she says, “a restaurant without beer was unusual!” She has since rolled out Lamonts eateries in Margaret River, East Perth and, most recently, trendy Perth suburb Cottesloe. Lamonts Cottesloe is a great find for wine lovers because it’s an enoteca. You can buy a bottle to take away or pay a mark up of $18.50 (as at September 2009) and enjoy it with an extensive “small tastes” menu based on local, seasonal produce (Exmouth prawns and asparagus when I visited). What’s more, irrespective of price, every wine from the impressive Australian and international range is available by the glass. Lamonts run a comprehensive tasting programme, with “Wine & food conversations” running from April to October. Find out more at www.lamonts.com.au. Open Daily from noon until 11pm. 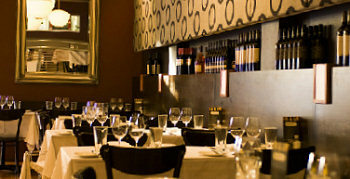 Must Wine Bar, Highgate, 519 Beaufort St Highgate, tel. +61 8 9328 8255. Located on buzzy Beaufort Street this is one of Perth’s best wine bars with a bistro serving chef patron Russell Blaikie’s inspired locally-sourced, seasonal dishes (very much a WA theme). Kick off in style in the Chinese lacquer box-like Champagne Lounge upstairs, which lists around 40 Champagnes. Five Champagnes, housed in a hollowed out block of ice, come by the flute. Downstairs you can mix and match excellent and generously-sized dishes like steamed Marshalls Torbay asparagus with “Over the Moon” organic feta and macademia crumble, Roquefort souffle with chives and Angel Hair Pasta tossed with Blue Manna Crab. Must’s co-owner, Garry Gosatti, drives the much-lauded 500 bin wine list which recently won the Gourmet Traveller Australian Best Wine Bar Wine List of the Year Awards 2009. Check out the website for seasonal food and wine matching events: www.must.com.au. Open daily from noon until midnight. Hyatt Regency Perth, 99 Adelaide Terrace, tel. +61 8 9225 1234. Inevitably, this member of the global Hyatt chain has a corporate feel but it’s one of Perth’s few five star hotels and has the facilities to match. If you visit at the end of October, it’s worth knowing that they host a tasting of the Qantas Wine Show of Western Australia’s Top 50 medal-winning wines and the show’s Awards dinner, tickets for both of which are available to the public. www.perth.regency.hyatt.com. Cullen Wines, Caves Road, Cowaramup, tel. +61 8 9755 5277. An iconic winery, certified biodynamic to boot, whose light and airy restaurant overlooking the vineyards also flies the flag for quality, sustainability and integrity. Vegetables, herbs and salad come from two biodynamic kitchen gardens which extend into the vineyards. Peas for my Deep Sea Snow Crab and Cullen garden pea risotto came from cover crop between the vine rows. Bought in food is, wherever possible, biodynamic, organic and local and includes gluten free options. The menu might feature Yallingup woodfired sourdough bread, Bindoo organic beef or Margaret River Creamery organic cheeses. Head chef Matt Egan has a delicate touch and lets the ingredients speak for themselves; Indian sous chef Sathish Kumar’s influence delivers an Asian twist. The six-bedroom Cullen Wines Homestead, built by founders Dr Kevin and Di Cullen, is available for let. www.cullenwines.com.au. Open daily from 10am until 4.30pm. Leeuwin Estate, Stevens Rd, Margaret River, tel. +61 8 9759 0000. Another iconic winery, with a stand out restaurant; also a renowned concert venue. It’s worth asking for a table outside on the balcony overlooking the garden. When I first visited with sommeliers and a wine buyer for Michelin starred establishments, we were blown away by the freshness of the fish and local marron (freshwater crayfish), a speciality. This time, I went richer and creamier, opting for a sumptuous Shark Bay crab souffle and warming Augusta Dhufish, scallop and mussel chowder. The wine list offers current and older vintages, which is great news for lovers of Leeuwin Estate’s famously ageworthy Art Series Chardonnay. www.leeuwinestate.com.au. Open daily for lunch and (unusually for a winery venue) on Saturday evenings. 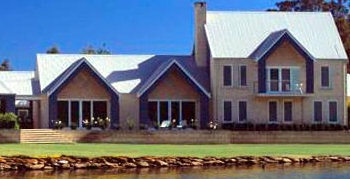 Burnside Bungalows, 287 Burnside Road, Margaret River, tel. +61 8 9757 2139. This biodynamic farm and vineyard (good Zinfandel) has four rammed earth and limestone bungalows to let. It’s located on a quiet road off the Bussell Highway leading into Margaret River Town to which you can cycle (Burnside hire out bikes) or walk on trails through the surrounding Bramley National Park. You can buy a tasty breakfast basket with fresh homemade bread, jam and produce from the farm; guests can also help themselves to fruit and vegetables from the vegetable patch and orchard. A fun farm stay if you have children in tow. The Settlers Tavern, 114 Bussell Highway, tel. +61 8 9757 2398. With its TAB betting station and throng of locals, the front bar of this traditional tavern on Margaret River’s main drag could be intimidating. Just remember this is chi chi Margaret River, head straight for the bistro at the back and you’ll find plenty to reassure you on the +250 bin wine list. It was voted Gourmet Traveller’s Best Pub Restaurant List in Australia, 2009 and hosts Karen and Rob Gough are wine nuts, so it’s an interesting list at that. The food also rises to the occasion – everything is made in the kitchen, preservative-free and your surf and turf is as fresh as a daisy: oysters and fish are shucked and filleted to order and steak is of the local wagyu variety. Also a live music venue and wifi hotspot. www.settlerstavern.com. Bistro (all-day menu) open daily 12 noon – 8.30pm. Must Wine Bar Margaret River, 114 Bussell Highway, tel. +61 08 9758 8877. The more sedate sister-restaurant of Must Wine Bar Highgate opened in 2009 and, while its menu is similar, the Margaret River venue has two aces up its sleeve. Food-wise, it’s famous for its locally sourced, dry-aged Butterfield beef. Local farm boy and The Dorchester-trained chef-patron Russell Blaikie says “I simply wanted to eat meat like I enjoyed when I was a kid.” Blaikie is also well-known for producing his own charcuterie for which he has won the national championship for 9 years. As for wine, Garry Gossati, has created a unique 500 bin list, about half of which comprises the most comprehensive listing of Margaret River wines you’ll ever find. Gossati invited every producer within the Margaret River GI to submit a wine, so lots of hidden gems here, as well as a separate Top 50 selection of famous names. Indulge yourself and stay closer than staggering distance in one of Must’s suites, above the restaurant. Check out the website for seasonal food and wine matching events. Cape Lodge, 3341 Caves Road, Yallingup, tel. +61 8 9755 6311. Cape Lodge has evolved from a luxury B&B into a boutique hotel which was voted Luxury Travel Magazine’s Best Boutique Hotel in Australia 2009 and listed in Conde Nast Traveller’s “World’s Best 100 Hotels” Gold List 2008. This is where the likes of Sting and Bryn Terfel stay when playing at Leeuwin Estate and its secluded, peaceful setting off Caves Road is beautifully landscaped. I suspect that the VIPs stay in the separate, five bedroom luxury Vineyard Residence. Otherwise, its very spacious suites are located in three lodges dotted around the grounds. It’s one of the very few places to stay in Margaret River that has a restaurant. And it’s not any old restaurant. The standard of cuisine and service is exemplary, really first rate, without being stuffy. Rather, the lakeside setting and clubby adjoining lounge make for relaxed dining. The menu changes daily, but I was glad to eat there several times because it meant I was able to savour Head Chef Tony Howell’s signature sashimi of hiramasa with Asian omelette and jasmine rice twice! Mr Cannavan, with whom I dined one evening, rated his food very highly too, including a main course of perfectly cooked Margaret River venison. Although Australian cheeses can lack depth and character, the Cape Lodge platter impressed, especially with the Tarago River Shadows of Blue from Victoria State. It’s a shame that the wine list is not as ambitious, but I’m told that changes are afoot. Finally, Cape Lodge offers cookery courses which I fancy will be very good indeed. Stonebarn, located off the South Western Highway, tel. +61 8 9773 1002. This is a new, designer boutique hotel surrounded by the towering karri and jarrah trees for which this wine region, just south of Margaret River, is famous. With six large, super stylish and comfortable suites, this is a high-end offering. The aim is to keep it small and intimate, focused on personal service from chef/manager Xavier Poupel whose cuisine is fairly classic/conservative rather than showy. The hotel is located not a million miles from The Wine & Truffle Company in neighbouring Manjimup (well worth visiting), with whom Stonebarn offer gourmet truffle weekends, at least until their own truffiere bears fruit.